We know the intricacies of Special Needs Planning because we live them on a daily basis. We are intimately familiar with both the legal and practical issues that arise when caring for an individual with special needs. Tom and Gayle’s youngest daughter and Amanda’s sister, Allison, is a young woman with Down syndrome living and working in the South Kingstown community. We are more than happy to share our experiences with other families and provide guidance for eligibility for adult services through the Division of Developmental Disabilities within the RI Department of Behavioral Healthcare, Developmental Disabilities and Hospitals (BHDDH). Allison currently lives in her own apartment in Wakefield with the assistance of her self-directed staff, friends and family. She owns her own photo/slide scanning business and frequently shares what it is like to be a person with Down syndrome to a variety of groups at private and public speaking events. Allison regularly competes in the Rhode Island Special Olympics Summer Games at URI. 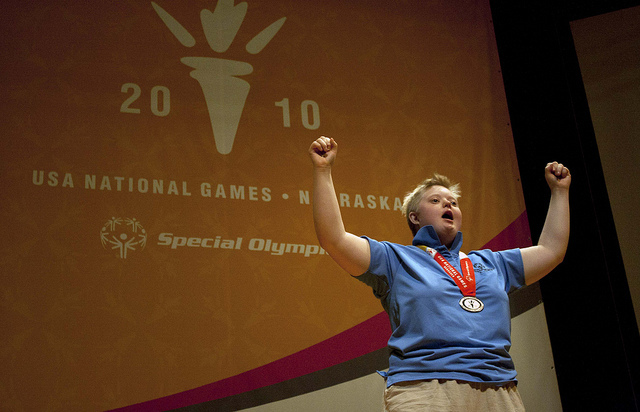 She is an accomplished Special Olympian powerlifter, having competed and medaled in the 2010 USA National Games held in Lincoln, Nebraska. If you have a child or family member with disabilities it is important to plan for what will happen to him or her after your death. Oftentimes the person receives government benefits such as Supplemental Security Income (SSI), Medical Assistance (MA) and food stamps (SNAP Benefits) all of which depend on the individual having limited income and assets. An outright inheritance can jeopardize your loved one’s access to these “means-tested” benefits. It is possible to provide a person with a disability with an inheritance without interfering with his or her government benefits through a Special Needs Trust. Our office can assist you in establishing a Special Needs Trust that can pay for items and experiences beyond the individual’s basic needs. We can help you develop a Special Needs Trust for advanced estate planning or provide a solution to a situation that threatens to make loved ones ineligible for government benefits such as Medicaid and Supplemental Security Income. We regularly prepare individualized Special Needs Trusts and assist with the establishment of Pooled Trust accounts. Please visit the RI Pooled Trust or Plan of Massachusetts and Rhode Island for more information about Pooled Trusts. Additionally, we represent both corporate and individual Trustees of Special Needs Trusts, including guiding them through the initial steps of accepting the position, advising as to permissible distributions and means of distribution, preparation of Trust accountings and ultimately winding up the trust. Passage of the Achieving a Better Life Experience Act (“ABLE Act”) provides another tool for individuals with disabilities and their families. The ABLE Act permits individuals receiving means-tested benefits to deposit up to $15,000 per year (for 2018), from any source, into a qualified ABLE account to save and spend on “qualified disability related expenses.” We help individuals and families understand how ABLE accounts work and when they may be a worthwhile option to consider creating. In December, 2016 Rhode Island launched its own ABLE account program, RI’s ABLE. The ABLE National Resource Center website provides up-to-date information on ABLE accounts across the country, helpful webinars and the ability to compare ABLE account programs in different states. We can help you and your loved one understand the benefits and requirements to create and maintain an ABLE account. Trustee Handbook published by the Special Needs Alliance is a free downloadable handbook essential for Trustees on Administering a Special Needs Trust. Special Needs Answers is a wonderful resource for families run by the Academy of Special Needs Planners. RI Department of Behavioral Healthcare, Developmental Disabilities and Hospitals is the state agency that provides adult services to individuals with disabilities in Rhode Island. Plan RI is a RI non-profit organization dedicated to assisting families with futures planning for their loved one and to create and maintain personal support networks to assure that persons with disabilities can enjoy “A Good Life” both while immediate family members are living and after their demise. Rhode Island Parent Information Network provides information, support and training to help Rhode Island families become advocates for their children. Paul V. Sherlock Center on Disabilities is a federally designated University Center for Excellence in Developmental Disabilities based out of Rhode Island College. Special Olympics of Rhode Island Get involved either as an athlete, volunteer or make a donation to an organization that fosters confidence and growth in individuals with disabilities. Social Security Representative Payee Guide provides guidance to individuals serving as Representative Payee on behalf of another person. Southern New England Social Assistance Association (SNESAA) Serves as Representative Payee for an affordable fee on behalf of persons with disabilities receiving Social Security benefits who do not have an individual willing to serve as their Representative Payee.